ONTRAPORT provides powerful sales automation with trial periods, payment plans, subscription plans, and two tier Partner (affiliate) commission calculations without requiring any manual intervention. All of these features are available using any of our payment gateways (except standard PayPal) without activating special extra cost features in the gateway itself. 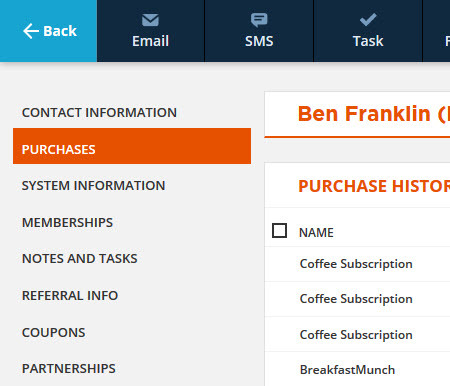 When you need to manually intervene for customer satisfaction reasons, you can manage each Contact's transactions on the Purchases tab of the Contact record. The Purchases tab in the Contact record stores the Contact's purchase history, last transaction information, last credit card used, a listing of individual transactions, the "open orders" (future payments for trial periods, payment plans and subscriptions) and credit card details (all credit cards entered from order forms and manual transactions). 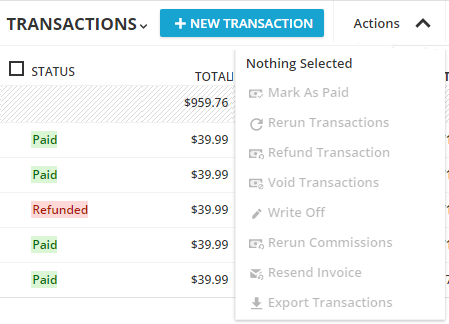 You can manually update customers credit cards, process transactions, re-run Partner (affiliate) commission and resend invoices from the Purchases tab. Credit cards can be edited by you in the Contact Record on behalf of your customer or by the Contact in the Customer Center of an integrated WordPress website. When editing a an existing credit card only the billing address and expiration date can be changed; other changes require a new card to be entered. The most common reason for editing the card will be to enter a new expiration date for an existing credit card. To enter or update credit card information, select the contact record, navigate to the Actions menu and select Log Transaction. If a card is on file, you can edit the details by selecting the card using the Credit Card dropdown and clicking the Edit button. Fill in the credit card information. Check with your payment gateway for the list of required fields (you may not need to complete the billing address section). Use the Action menu to charge or log (without charging) a manual transaction. See our article on Manual Transactions for step by step instructions! In the Transactions section the Actions menu lists 8 different actions. If an action is not available for the selected transaction it will not be shown or will be greyed out. Mark as Paid: Available for unpaid transactions, such as those in Collections, this option marks the transaction as paid without processing it through the payment gateway. Rerun Transaction: Available for transactions in Collections, this option attempts to process the transaction through the payment gateway. This is most often used after manually updating the credit card details. Not available for standard PayPal transactions. Refund Transaction: This option marks the transaction as refunded and, with all gateways except PayPal, attempts to process the refund through the gateway. If you are using standard PayPal you must process the refund through standard PayPal, then use this function to mark it as refunded in ONTRAPORT. Note that some gateways have a time limit on refunds or may limit the ability to refund charges. These factors are beyond our control and cannot be remedied by ONTRAPORT. We recommend that you verify your first refund through the payment gateway by logging into the gateway's administration section. Void Transaction: Available for transactions that are already paid and those in collections. Voiding a transaction erases it but does not attempt to void or refund the transaction through the payment gateway. Write Off: This option marks a transaction in collections status as a "write off". Accounting systems may treat any orders in collections as bad debt and written off after a defined period of time, such as 90 days. Check with your accountant for the proper use of this feature, as it varies by business type and tax authority. Note: ONTRAPORT's built-in Collections and Recharge Settings uses a default of 90 days to convert an order in collections to write off status. Re-run Commission: Most commonly used after manually updating a Contact record's First and Last Referrer, this option re-runs the commission calculation. This can have the effect of removing commissions from one Partner and adding it to another, or adding commission to a Partner who was not originally specified in the First or Last Referrer fields when the transaction was completed. 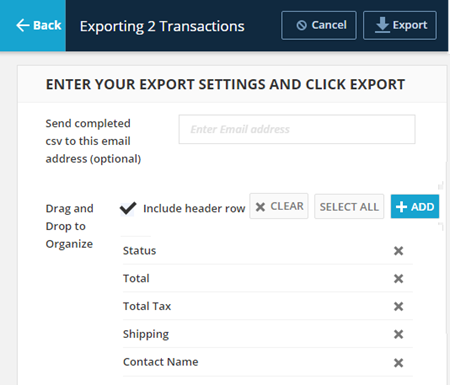 Export Transactions: Select one or all transactions and export them. A CSV file can be sent to any email address you specify. Prior export files are stored in the Export History section to download again. Note: This function exports only the transactions for this individual Contact. All transactions can be exported in Sales Reports in the Sales collection. 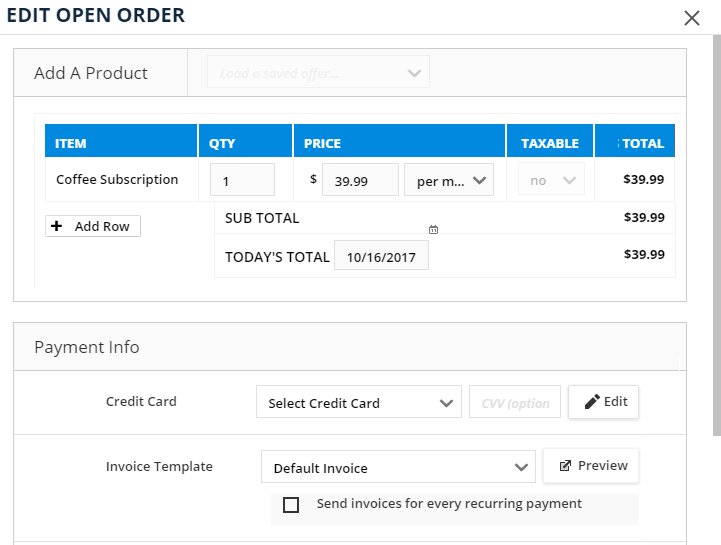 The Subscriptions and Payment Plans section shows the upcoming charge or "open order" for any subscriptions or payment plans for the Contact. Select the open order and use the Actions menu to Delete or Edit the open order. Delete: Cancels the entire subscription. If the subscription is WordPress membership, be sure to remove access to the site in the Memberships section of the contact record. Edit: Opens the Edit Open Order dialog. Send invoices for every recurring payment: Check to automatically send invoices when each payment is charged. The ONTRAPORT Q & A Forum provides peer-to-peer support from our Certified Consultants and other ONTRAPORT clients.